Transform a CD-ROM Drive into a Car CD Player! To be used as CD player, the CD-ROM drive doesn't need to be connected to the computer. This way, it is possible to easily transform a CD-ROM drive into a Car CD player. Sounds crazy? Not so. With this tutorial you will be able to have a CD player in your car without spending almost anything. The CD-ROM drive to be use may be of any type, from the first models ("1x") until the most modern ones ("60x"). The only prerequisite is that the drive needs to have is an earphone plug and volume control. And practically all CD-ROM drives have that. There are two great advantages in transforming a CD-ROM drive into a Car CD player. First, who will want to break your car window to take CD-ROM drive? And, secondly, since any type of CD-ROM drive can be used, you may take an old drive that is just dusting away in your house (for instance, a 2x drive from an old 386 computer), which brings the cost down to almost nothing. To install a CD-ROM drive in the car, you will need a female power plug, to be used to fit into CD-ROM drive power plug (that plug can be cut from an old power supply) and a voltage regulating integrated circuit called 7805, that may be easily found at electronic parts stores. You will also have to buy a heat dissipator for the 7805 (sold at the same store). 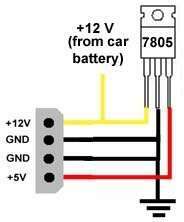 The car battery is a 12 V one, but the CD-ROM drive needs two voltages to work: 12 V and 5 V. The 7805 circuit is able to convert a 12 V voltage into 5 V (its pin 1 is for the input, its pin 2 is the grounding, and its pin 3 is the 5 V exit). Figure 1 shows the plan for the connection. The grounding pin should be connected to the wires of the plug grounding and the negative pole of the car battery, what is done by simply connecting that pin to the metallic body of the car. Figure 1: CD-ROM adaptor schematics. All you have to do is to make the connections shown in the above schematics (don't forget to isolate all connections with insulating tape) and you are set: you will have a CD-ROM drive working as CD player in your car. The audio output will be made using the earphone plug. To listen to a CD, you will have to use earphones. To have the sound come through the speakers of the car, you will have to buy an amplifier with RCA inputs and a stereo P2 (mini jack) x stereo RCA cable (the same type of cable used to connect Discman units to amplifiers). The stereo P2 plug (also known as mini jack), which is the one used for the earphones, should be fit at the earphone output of the CD-ROM drive, while the RCA plugs should be fit at the input of the amplifier. The volume control will be made using the volume control in the CD-ROM drive. A last warning: in most CD-ROM drives, the reproduction button (play) and the advance button (skip) are on the same key. In other words, to skip a track, all you have to do is to press the play button. Can the CD-ROM drive in use as a car CD player reproduce MP3 files? No. If not connected to a computer, the CD-ROM drive will only work to play audio CDs. Music CDs in the MP3 format are recorded in the CD-ROM format. To read it, the unit forcibly needs to be connected to a computer. MP3 songs are not played by the CD-ROM drive, but rather by the sound card of the computer, and the machine processor is responsible for transforming the MP3 format into an audio format. Car CD players that play MP3 have a dedicated processor capable of reading the CD-ROM format and of converting MP3 files into audio ones. Since the common CD-ROM drive doesn't have such processor, it can not play MP3 files. Can the same adaptation be made so CDs may be played in a domestic sound system? Yes. To do so, the sound system must have an auxiliary input channel. However, to prevent the sound from getting distorted, you will have to use the audio output at the back of the CD-ROM drive and nor the earphone output, as mentioned last week. To do this, you will have to take the audio output cable from the CD-ROM drive and solder two RCA plugs - a black or white one (left channel) and a red or yellow one (right channel) – at the end that should be connected to the sound card of the computer. If you don't know how to do that, contact an electronics technician. To feed the CD-ROM drive you may use a power source from an old PC. One important detail: AT power sources have an on-off switch, but the ATX ones don't. If you will use an ATX power source, you will have to make a pin-14 connection (green wire), from the main plug of the source to any black wire to turn it on. Won't the CD oscillate too much? That will depend on the unit used (its manufacturer and model). Of course you cannot expect a CD-ROM drive to have the same stability of a car CD player. Remember that our tip is to assemble a car CD player spending nothing (or almost nothing). If you used our tip it is because you are possibly not willing to buy a car CD player. Why should the connection between the CD-ROM unit and the amplifier be made using the ear phone output and not the one at the back of the unit? That is because car amplifiers don't usually have volume control. If you use the output at the back of the CD-ROM drive – which doesn't have volume control either – the sound from the amplifier will always be at its loudest. We believe that this is not convenient. If you should use the output at the back of the CD-ROM drive only if you are to connect it to a pre-amplifier, equalizer, mixer, or home sound system, since they have volume control.